Niagara Falls is a very exotic and fabulous, this waterfall is located on the border between the United States is the State of New York with the Canadian province of Ontario. This waterfall is about 17 miles (27 km) north west of Buffalo, New York and 75 miles (120 km) southeast of Toronto, Ontario. The name “Niagara” is derived from Indian languages, namely “Onguiaahra” which has meaning Strait and other word is “Ongniaahra” which means it is the roar of the water, before the waterfall is named Niagara, before the public about calling it “Niagagarega”. Niagara Falls was formed about 18,000 years ago, when the ice cubes in the southern part of Ontario that are 2-3 km thick, has started to melt and flooding of Lake Erie and then melt the ice is flowing through the Niagara River meets Lake Ontario and that then flows into the sea via rivers St. Lauwrence, Niagara peninsula free of the ice sheet about 12,000 years ago. When the ice melts to form the Niagara River flows, and river erosion and form the Niagara Falls. Niagara is the name of a group of three waterfalls. 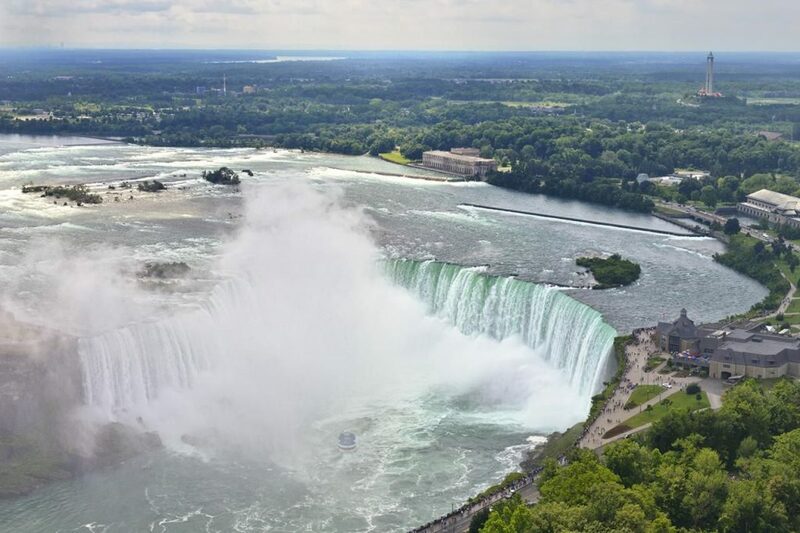 The third waterfall is a waterfall Horseshoe (sometimes commonly referred to as Canada’s waterfall), waterfall America, and the smaller Bridal Veil waterfalls that are separated by an island called Luna Island from the main waterfall. This waterfall can be split into three parts as in the upper Niagara River flowing from Lake Erie as far as 35 km, split by the “goat island”, thus forming three waterfalls. Later the water that falls to a very heavy hit the rocks below the rate of 40 km to 100 km per hour, thus forming a water depth of up to 52 m below the surface of the river. After water poured into the bottom of the Niagara River, then the river turned to the right (90 degrees) and flows along the 23 miles to the lake Ontario, Canada. Niagara is the widest waterfall in the world to-5 after the Waterfall Country Guiara in Paraguay, and Celilo Falls in Oregon United States, Kettle Falls on the Columbia River and the United States is the most wide Victoria Falls in Zambia and Zimbabwe, Africa south. Although not the highest waterfall or waterfall is the widest waterfall is very famous and spectacular with a volume of 2.271 million liters of water per second, the water flowing from the waterfall is a source of drinking water for approximately one million people in Canada and the United States, when you visit this tourist area you can do many things of which you can fish, swim or canoe and of course trying to play seen rainbows that often appear in this waterfall.